In August I did a quick review based on the new Hobie Outback I got to test paddle in Oklahoma City at Paddle Sports Retailer. When I got off the water I knew I would have to buy one. Fast forward a few weeks and I bought my very own from my good friends Aris, Dave, and Adrian at Mariner Sails in Dallas. (I went camo color). And now after several trips out in the Outback and two tournaments fished, it’s time for a real world review from an actual owner. If you want to check out the specs and features, you can catch those in the initial review here. The first surprise with the new Outback was the space in the cockpit. From all the videos I had seen and comments from several others, there was a lot of concern it would be cramped. The cockpit area isn’t cramped at all. I have plenty of room to get into the rectangle hatch in front of the seat and space on both sides. I’ve started storing a ton of my soft plastic baits in the rectangle hatch because I’m constantly having to put a new one on etc. I’ve got 30 bags or so of assorted worms and have room to spare. This is also proving to be a great place to throw treble hooked baits I am cutting off in a hurry and keeps them off the deck and out of the way. For reference on the cockpit size, I’m 6’2″ and about 200 pounds. It also helps that the new Vantage CTW seat has a slight recline option to modify the angle I’m sitting and giving a couple of more inches of leg space if I really needed it. Steering in stereo with independent cabling as a fail safe. The dual control rudder is really nice and while both handles are linked, they are independent so if I lose one side to a cable snap, I don’t loose rudder control in both. An ambidextrous steering option is a nice touch and great for peace of mind if offshore. The Guardian mechanism for a retractable transducer for my Garmin has been money. A cool trick I have discovered is when fishing in a lot of grass if my transducer gets covered in grass and I see interference on the graph, I can raise and lower the transducer and almost everytime it clears the grass. The tankwell on the 2019 Outback is huge. I have yet to fill it up. I took a cooler, Blackpak, net, Hawg Trough, and 360 light the last time up and still had space. The square footage back there might really come into play for camping trips. If you decide you don’t want to haul a crate, you can fit four 3700 series Plano boxes in the side storage pockets. Traveling light without having to go minimalist. 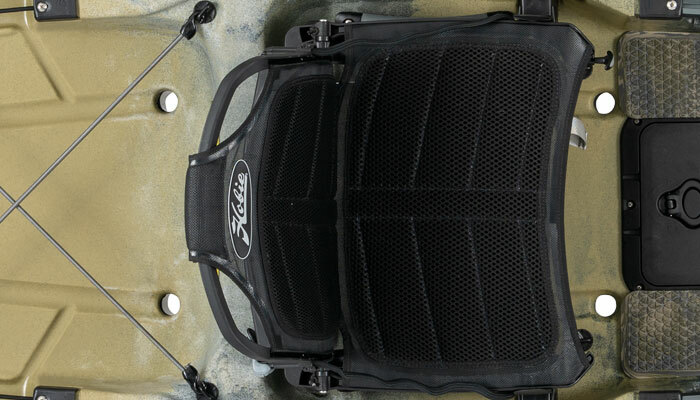 While the Outback has four flush mount rod holders molded in, the front storage retention cables can also double to keep your rods lashed horizontally to the deck if you need to avoid height and/or wind. I haven’t tested the resiliency of the retention cables yet but it could potentially be a solution for breaking through waves while reducing the need for leashes everywhere. Maybe. In the edges of each side of the photo, you can see my rods lashed in a horizontal position on the 2019 Outback. How Does the New Outback Perform? The Mirage180 Drive with this new hull design is flat out fast. It can also cut through the wind well. At just a walking pace the 2019 Hobie Outback will pace for me at 2.5mph on the GPS. I’ve tested it in flat water without wind and gotten short bursts over 5mph. I can speed walk the drive at 3.75mph for about 30 minutes. That’s a pretty quick clip. I mention the low profile design to say how little the wind affects the 2019 Outback compared to previous models. It’s considerably better. 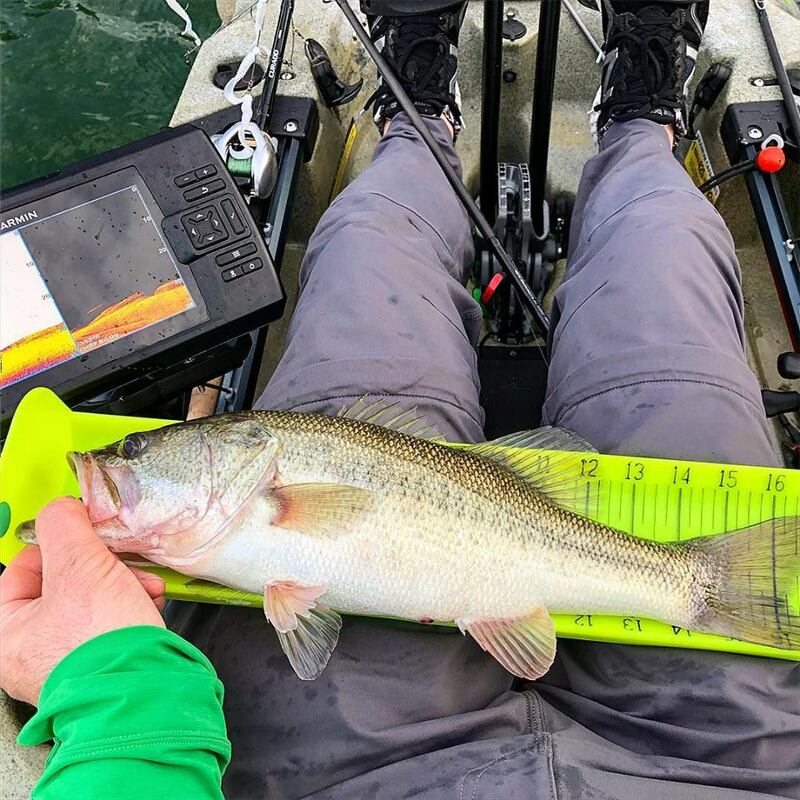 The turning radius of the new rudder is markedly better than the original rudder and the option to stow it with the cable system like the Pro Angler utilizes is the right move by Hobie. 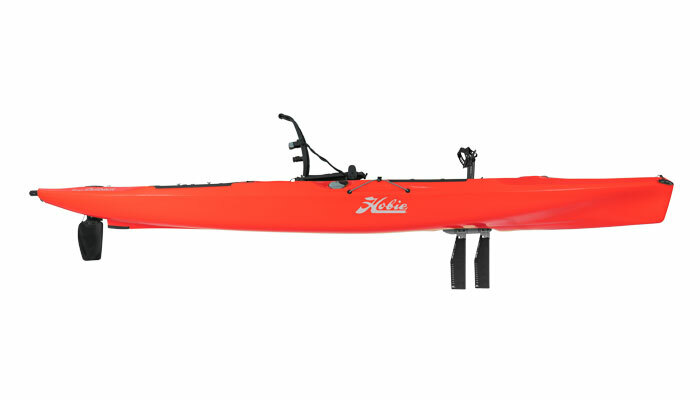 The 2019 Hobie Outback is a much better paddling kayak than before as well. When it gets up to speed it holds a line well, has a decent holeshot to get there, and most surprisingly turns 90 degrees with one deep paddle stroke. 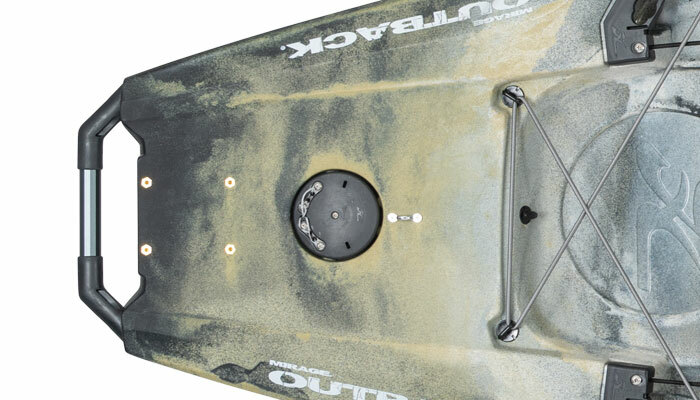 In previous models, a paddle didn’t have much use but now, you can pull the drive and cruise the flats or shallows without it being a tugboat. Many people have also been curious about the stability and ability of many people to stand in the Outback. It’s not a Pro Angler but I would put it up against some of the more stable paddle kayaks. It felt close to the Bonafide SS127 and on par with the Wildy ATAK 120. 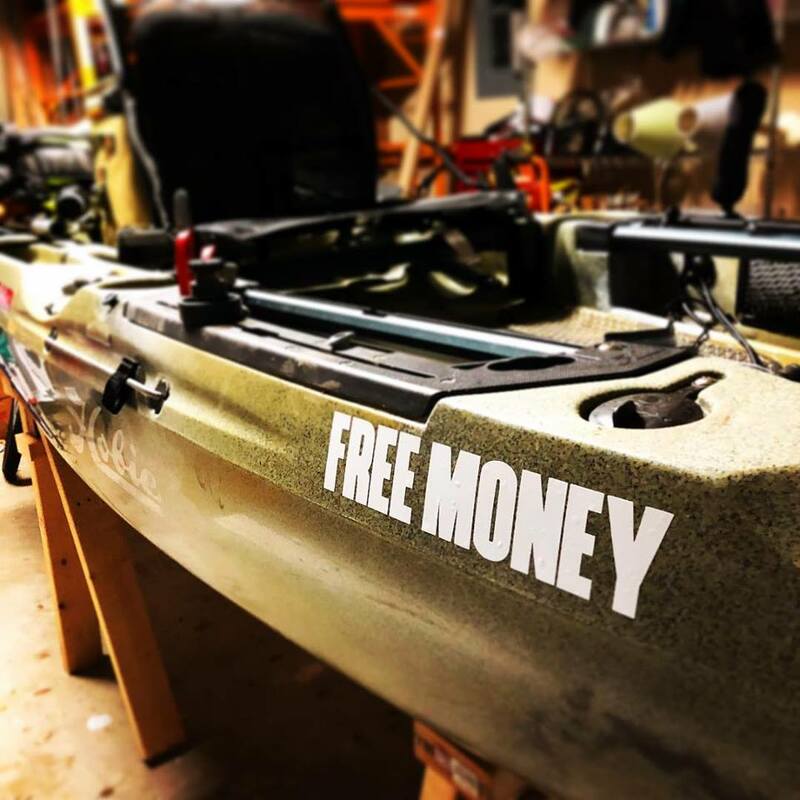 My 2019 Hobie Outback “Free Money” because I’m a professional entry fee donator. I find myself in the front hatch a lot, stowing gear, plugging in my power source for my fishfinder and other things and everytime I do, I wish there were a little more secure front hatch solution. The corner strap bungees have been around a long time. I often find one of them caught under the lid. I’d love to see a T-handle latch on each side like you see on a Yeti cooler. A bungee fix to keep the seat open or closed would be great and not cause a rework on the hinge tension. When standing, the seat back in the wind will flop down on you. That won’t be good if you have to sit quickly and don’t look. 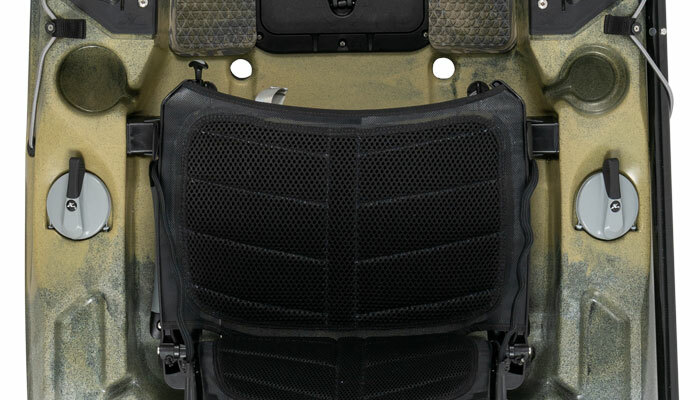 It could potentially bend the seat frame and put undue stress on the hinges. I’d love to see a bungee mechanism to hold the seat open when you want it open. It could keep it closed if you were transporting with the seat in the kayak. It could be a fairly easy DIY fix. Maybe some bungee and a couple of grabs could work well and not cause any redesign woes. The loading block to guard the rudder when loading up and out works to guard the back end whoever you have to set it down and leverage from another point. A wheeled version where you had some small wheels where the feet of the loading block are would be dynamite. The common thought would be to just use a cart but the tankwell is so long that the standard height HD cart from Hobie doesn’t hit the ground before the rudder. Moving the scuppers back a little might fix that however you’d lose a full drain in the tankwell. On the rudder, I believe those are nylon cables. Over time they will stretch. I am curious if a wire solution would work better to make sure rudder response stays true. While it’s not an improvement point, an important thing to note is about the Guardian system. It does NOT come stock as a functioning component. The instructions to make it functional and linked up to the retractable cord are in the manual. Please follow them because it is not an intuitive thing at all. I spent a good bit of time trying to figure out why the thing wouldn’t recess. And then I read the instructions. Make sure you do that. Keep in mind, I laid down my own money. I wanted to have one of these as quick as I could buy one. I’m not on staff with Hobie, just an owner. I’ve owned Outbacks and other pedal kayaks. Quite frankly I don’t know that I have ever seen a better combination of pedal and paddle power. The 2019 Hobie Outback is full of features, performance, and design. I don’t know if there has ever been a more complete do it all kayak. 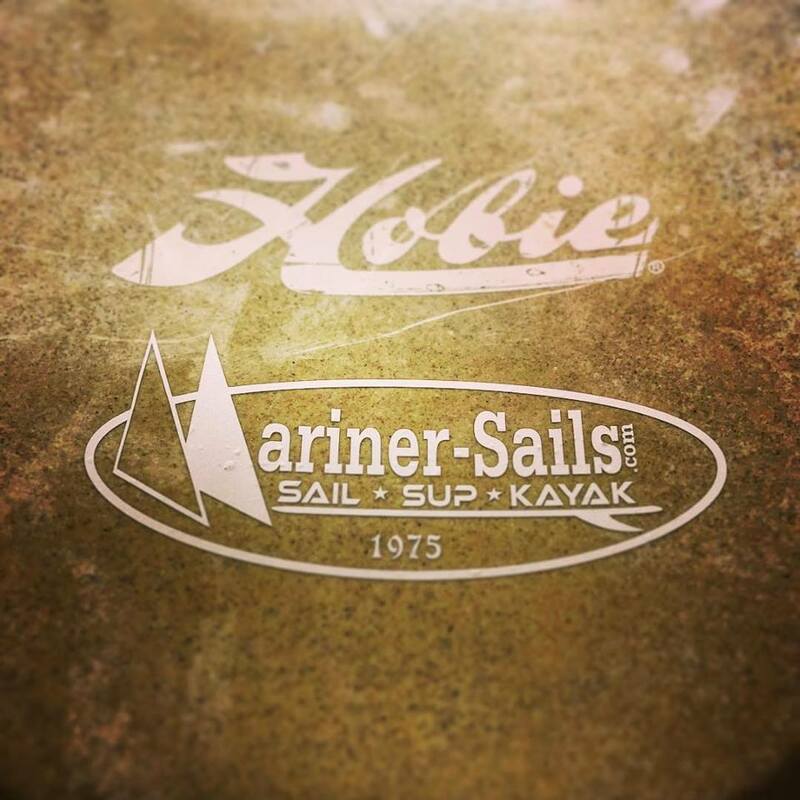 The rudder lines on all Hobie’s are Spectra cord. No need to worry about them stretching. Nice review , thank you. 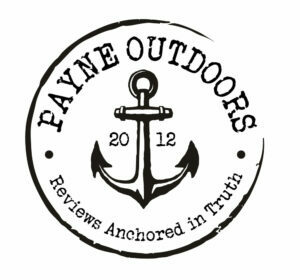 I am looking at kayaks for bass fishing and I have narrowed it to the Radar 115 or the Outback. I’m a little concerned about the new Helix drive and dependability and the cable to deploy the rudder. I am leaning toward the Outback but I like the length and seat height better on the Wilderness. Now that you own the Outback do you have any things you like more on the Radar 115 ? I can’t demo a radar unless I drive 6 hours each way . There is nothing on the Radar I like better than on the Hobie. The 2019 Outback is hands down a better kayak.